When you are doing some longer running operation in a program, you want to give some feedback to the user. 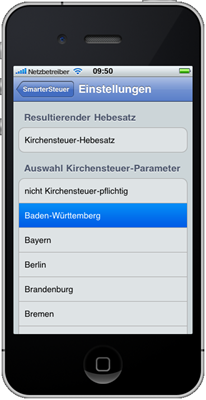 This blog post looks at some ways on how to do this in iOS. 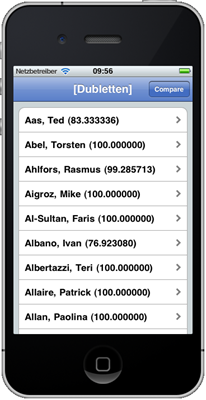 I’m using my ongoing work on my next iPhone app “SmarterContacts” [include link] which will find and eliminate duplicates in your iPhone contacts. One of the strengths of the iPhone interface is its constant and almost immediate feedback to the user. For example, if you scroll through a long TableView, it feels as if you are grabbing the contents and “throw” it up. You can tell that a lot of work has been put into this user experience, and it’ obvious that you should avoid breaking this feedback loop when writing your own apps. In iOS, this is an animated “spinning wheel” that shows that something is still going on. Other OSs use the same idea, but a different metaphor (OSX has the beachball on earlier Mac versions it was watch, Windows used to have an Hourglass and now has a rotating orb.) 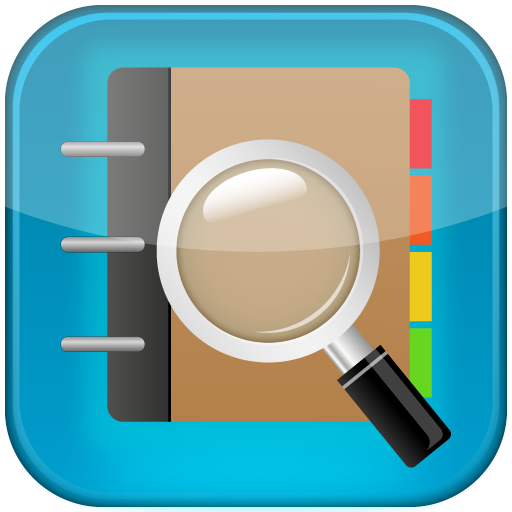 The ActivityIndicator is the simplest way to provide feedback – you just add one to the current view, start it spinning, do your operation and then remove the it. One important drawback is that the ActivityIndicator doesn’t give any feedback to the user about actual progress, i.e. how far along is the operation and how much longer is it going to take. This is not a problem for operations that are reliable and take just a few seconds. But for anything longer, the user might give up on the program. The ProgressBar provides much more feedback to the user: It shows that the program is still making progress as the bar nudges on and on, and it allows the user to make a rough estimate of how much work is left. However, it requires a bit more work by the programmer to update the ProgressBar. It also requires the programmer to figure out what “80%" done” means – this is sometimes tricky when there are a lot of different steps involved. 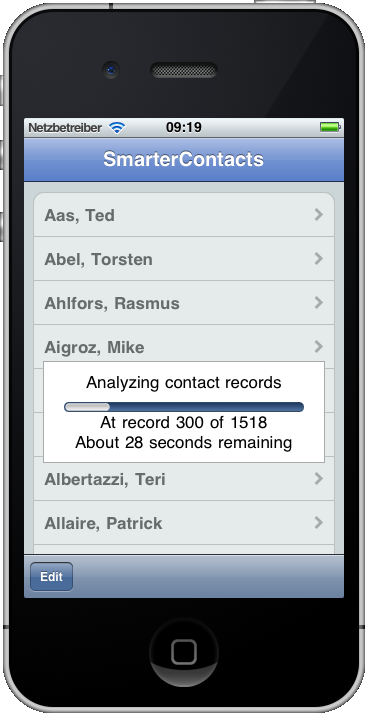 In my app one long running operation is comparing the different contacts and figuring out how “similar” they are to one another. As this requires comparing each record to all other contacts, the program has a characteristic of O(n^2) which quickly gets noticeable when working on more than 100 records. Therefore, I want to provide feedback to the user while this operation runs. 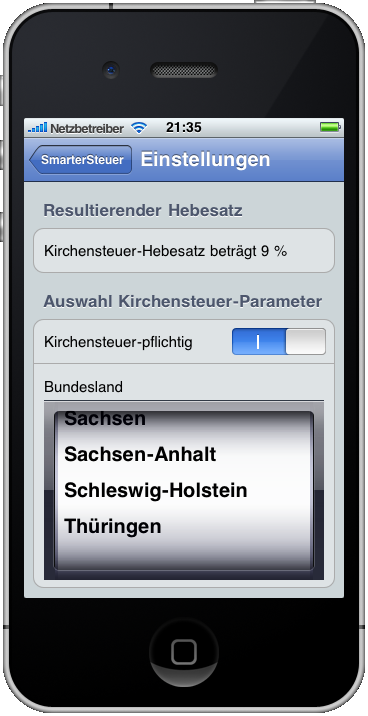 As this takes more than a few seconds (even in the simulator, which is a lot faster than my iPhone 3GS), I wanted to use a ProgressBar. I also wanted to provide some additional feedback (such as “at record x of y” and “z seconds remaining”), so I built a nice looking ProgressView. All that’s left to do, is to open the view at the start of the long-running operation using addSubview: and then update the ProgressView by calling setCurrentValue:. When the operation is done, we just remove the ProgressView using removeFromSuperview. This almost works .. the ProgressView is displayed at the start and removed at the end of the operation, but then it is not updated during the operation – which means no feedback to the user and it looks like the program crashed. The reason for this behavior is that the screen is not updated while the operation executes – I’m not exactly sure when the update would occur (unless when the whole operation is over). This is because the simple program is unthreaded, i.e. there is no thread that is available to update the screen. In VisualBasic there is the expression “Do Events” which basically turns control over to the OS to process screen updates, user inputs etc. 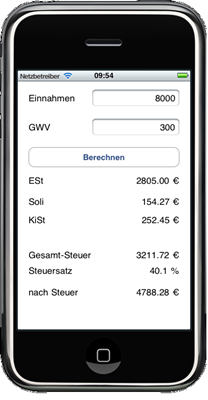 There does not seem to be an equivalent expression in iOS, instead we have to delve a bit into threading to separate between the screen updates and the calculation. The NSOperationQueue basically set ups the threading environment, so that as soon as an operation is added to the queue, the execution is started in a secondary thread. I’ve had some problems passing an object using the “withObject:” selector, probably because I was using memory that was only available to the secondary thread. (Probably because it was allocated by the secondary thread.) Instead, I was able to use a property of the view that created the secondary thread. 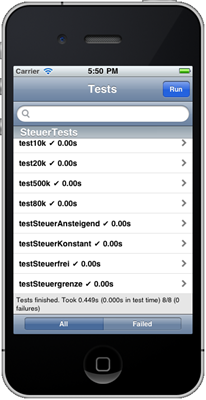 Again, this calls the main thread to notify that the calculation is done and that the ProgressView can be removed. We’ve managed to build a good looking, informative ProgressView. In addition to implementing the code to display, update and remove the view, we also had to make sure that the ProgressView is updated on the screen by creating and using a secondary thread. The additional code required for the threading was quite small, and it was able to use the original, unchanged code for the ProgressView. After trying out a few things during my last train rides to my consulting engagement, my next iPhone app is slowly taking shape. Each cell in the TableView represents the contacts in the address book. The number in braces shows how “similar” another contact record is. (The number shown is for the “closest” record.) I want to make things a bit easier to spot by coloring the cells (e.g. red = 100% match, yellow between 90 and 100% match). I’ll also add some way to filter the displayed records (i.e. display only records above a certain threshold). In the detail view, I want to display the “closest” records for one address and provide some way to look at the details of the involved contacts. (As this might require quite some back and forth between the different contact records, an iPad with additional screen estate may be a good idea here.) The detail view should also have some functionality to “remove” unwanted records (duplicates) or “merge” two records (collect all different phone numbers, email addresses etc. into one contact record and remove the other one). Removing exact duplicates – Often, there are exact duplicates in the address book (for example after some technical problems with synching). These should be relatively simple to identify and delete. 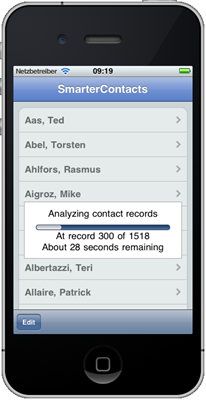 Merging contact records – This is a lot more complicated as there are quite a few different scenarios. For example, you have to pick a “surviving” name (as there can be only one name), but there can be multiple addresses, phone numbers or email addresses. Standardization – For some fields, different content can mean the same thing, e.g. “1231234567” is the same phone number as “123 123 4567” or “(123) 123-4567” or “+1-123-123 4567”. I’m not sure how much there can be done here, especially in addresses (Memory Lane = Memory Ln). Once I get started, there’ll probably be more modules that make sense in the given context. 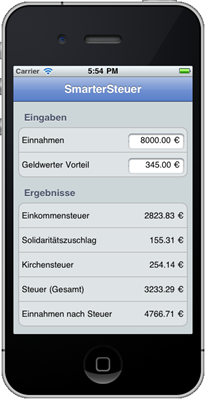 This will also be a good scenario for “in app purchases” that I want to look into. 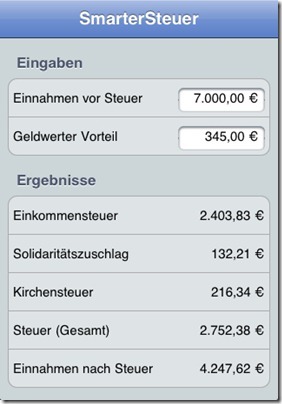 My Tax App “SmarterSteuer” has been in the iTunes App Store for almost a month now. Of course, the sales are not even remotely close to allow me to quit my day job – at 1.59€ and about 25 sold apps I haven’t even recovered the cost for my membership in the Apple development program. 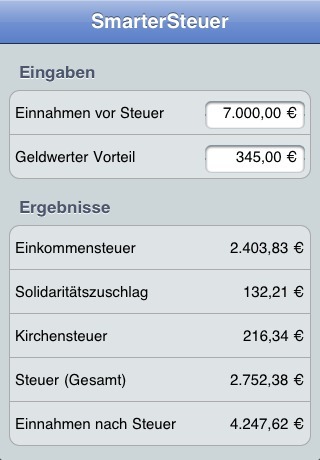 Nonetheless, I’ve been impressed with the number of sales and the pretty level number of sales from day to day: The tax app is quite limited to a certain type of user (freelancers that have recently started and are trying to figure out their taxes) and it’s only applicable to Germany (and it’s only available in the German App Store). I’ve been trying to guesstimate the market size for a general purpose app that would be sold worldwide. 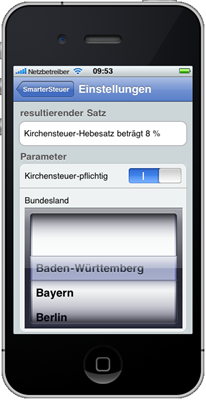 I’ve been trying to find out how many iPhones have been sold worldwide and in Germany. Apparently, Apple releases quarterly numbers (compiled in a nice sales graph by wikipedia) which would put the number of iPhone sales worldwide to about 90 million at the end of 2010. I couldn’t find any matching numbers for Germany, the latest number I could find was 1.5 million at the end of 2009 where the worldwide number was at about 40 million. That would put the worldwide market at about 27 times the German market which is consistent with a 4% market share that admob is estimating for Germany. Let’s work with a nice round factor of 25. It’s even trickier to estimate what part of the current German market would consist of freelancers. In the general German population you have roughly 1 million of freelancers (with 81 million Germans total). I’m assuming that that percentage would be mich higher among the owners of an iPhone. 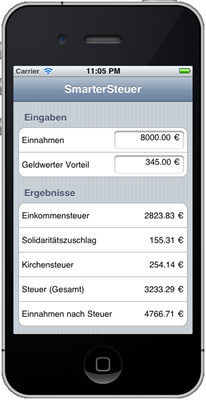 Just for arguments sake, I’m working with a percentage of 10% of freelancers in the whole iPhone market in Germany. If we take these two numbers, we come up with a factor of 250 – i.e. the market size of a general purpose worldwide app is about 250 times as large as the market that I’m currently addressing with my text app. This may not translate to 250 times as many sales or 250 times the revenue, but even 100 times the sale of my current app would be quite impressive. I’m not sure how if these numbers are reasonable (please let me know if you have better numbers or estimates) – but it’s certainly encouraging enough to contemplate writing a general purpose app that can be used worldwide. I think that this may be a valuable app, something that people are willing to pay for. I’m not sure about the effort required to develop such an app, but I’m ready to start. Most of the technology should be pretty straightforward (accessing the address book, comparing records/strings etc.). I’m going to mull this over for a few more days, but I think I’ll get started as soon as I have some time available.